The Apple Support Profile page provides an excellent dashboard to check technical support history, status, and warranty information for all registered Apple products under ownership. Assuming you have used the same Apple ID (email address) for all purchases and registrations, you’ll find every Apple item you’ve bought and registered here, including Macs old and new, iPads, iPods, iPhones, and more. 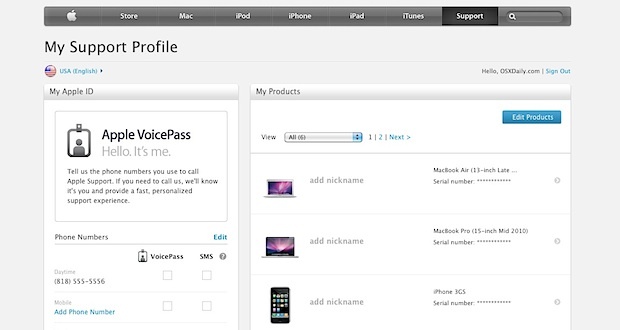 Remember, to take full advantage of the Apple Support Profile, be sure to always use the same Apple ID when registering new products. This is an extremely useful site for tech support, troubleshooting, and general ownership purposes, be sure to bookmark it. Nice tip from @MacGeekPro. This is the kinda stuff we want to see!